Exim Bank is one of the leading financial services providers in 4 countries and Tanzania's first international bank. Since welcoming our first customers in Samora Branch, Dar es Salaam, in 1997, the bank has continued to expand its national and regional reach over the years leveraging on the underlying resilience to grow our asset base and to successfully expand strategically. The Bank's operations span across Tanzania and overseas subsidiaries in the Union of Comoros, Republic of Djibouti and Uganda — an international presence unmatched by any other indigenous Tanzanian bank. Exim Bank's core purpose is to be the bank of choice through its pioneering and constantly innovating banking solutions to facilitate our customers and transform their lives and businesses. At Exim Bank, success is defined by how we make a difference to our clients and our communities, driven by our mantra of Exim at work today, for tomorrow! The Bank is currently looking for visionary leaders to spearhead and carry this mission forward and join us in this transformation journey! Reporting to the Board of Directors with the primary objective of establishing the bank as a financial powerhouse in and across the region. The ideal candidate for this position will be a seasoned banker who has transparent and outstanding work ethics and integrity; highly innovative and with exceptional track record in managing a reputable commercial bank. 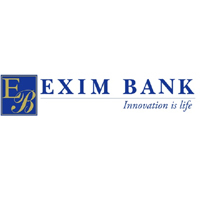 The Chief Technology Officer (CTO) is expected to create a technology led digital banking vision for Exim Bank Group, with digital being the distinctive differentiator in the entire banking spectrum at all operating territories, to achieve bank's overall business objectives. The ideal candidate for this position will be a seasoned Senior Banking and Technology Professional with experience in Operations and Technology for leading banking / financial institutions. The positions carry highly competitive salary commensurate with the right candidate's qualifications and experience.